Flambe Yellow Strawflower This annual is a ‘Proven Winners’ plant. Flambe Yellow Strawflower is a heat tolerant and drought tolerant annual the is great for those spot that are hot and dry. 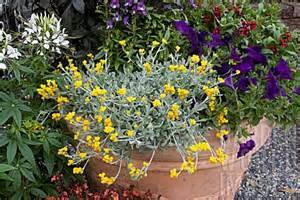 In fact, it does best in a hot and dry environment but can still survive light frosts. This is one tough plant! Flambe Yellow Strawflower will grow to a height of 8" to 14" tall and 8" to 12" wide. It has been known to trail up to 24" making this a Spiller plant for containers or baskets. It will bloom from early summer until a hard frost. The yellow blossoms are a bright, deep yellow. Plant in full sun and well drained soil. Flambe Yellow Strawflower is self cleaning as it will overgrow the spent flowers and cover them.